The hugely publicised arrival of an Emperor penguin to the Kapiti coast coupled with the rare opportunity to see this Antarctic native explains the throngs of people paying to see Happy Feet at Wellington Zoo. Not long before this, besotted visitors queued at Auckland Zoo to see Sirocco, the kakapo made infamous with his televised seduction of Stephen Fry. But how will little blue penguins, tui and (even further down the glamour charts), the banded kokupu compare with the kakapo and penguin’s rarity and celebrity when it comes to selling zoo tickets? It’s a question that springs to mind as Auckland Zoo prepares to open its $16 million native flora and fauna exhibition at the end of the year. Te Wao Nui is the largest project in the zoo’s 88-year history and involves the Department of Conservation and Ngati Whatua o Orakei as conservation partners. Species will include the aforementioned penguins, tui and kokupu, as well as bellbirds, long-fin eels, short-tailed bats, morepork, cave weta and land snails. Ian Fraser, curator of native fauna at Auckland Zoo, says that “some species are not as common, or appreciated as you might think”. He’s got a point: people on the coast are more likely to recognise the squawks (and pungent odour) of little blue penguins swimming to nest after a day’s fishing than people who live inland. In Hamilton, tui are only just returning to gardens and parks. Ian says that people don’t necessarily appreciate, or even notice, the birds in their ‘burbs until they know what they are. “We will present tui and bellbirds and the eels as a special endemic species so that people notice and then recognise the birds in the wild. Familiarity is a good starting point for a greater appreciation of local biodiversity,” Ian says. The concept of ‘advocacy animals’ also comes into play. The popularity of Happy Feet and especially Sirocco rationalises their role as advocates—captive representatives of a vulnerable species. “In the zoo, we can advocate for lesser-known species such as the long-finned eel and make poster children of them,” Ian says. The zoo will have to maintain its population of endemic and endangered long-fin eels by capturing wild eels. But as Ian comments wryly, the zoo eels are at least safe from the fish markets. By this he is referring to the anomaly (to put it mildly) that legalises the commercial harvest of our endemic and endangered eels. Education and advocacy intentions are all very well, but a zoo by nature has to balance its conservation and commercial efforts. They need to get enough people through the gates to pay the bills and stay viable as a council controlled organisation, or a registered charity running a ‘not for loss’ model. Are our native species enough of a draw-card? Children are infatuated with chimps, big cats and giraffes. But will a powelliphanta land-snail – as beautiful as the amber, ancient mollusc is – enthral the four year old and secure repeat visitation? Will the time-constrained cruise ship tourist take the time to try to spot banded kokupu through a pond surface? Or will they head straight to the red panda enclosure for a quick thrill? Ian is convinced the accessibility of native species in zoos will prove to be popular amongst time-strapped wildlife lovers. After all, the likelihood of spotting a short-tailed bat in the dark is slim compared to ogling clusters of bats in an enclosure under infrared lights. Giant weta litter the pathways on Matiu/Somes Island, but the ferry-ride and night-time excursion (fun!) might complicate things for parents. Stephanie Gray has contributed 6 entries to our website, so far. View entries by Stephanie Gray. The displays seem to be based on habitats as opposed to individual species, with flora and fauna that’s typical of that habitat (eg forest, or wetland, or high country…) so hopefully people will be shown individual species when they go to look at a particular habitat enclosure. Hi, the night display DOES looks awesome! What do you think about kune kune pigs, tzar goats and sheep in a zoo? the ‘petting zoo’ model? My own thought is that zoos like Auckland (and Wellington too) with it’s planned very expansive native section with five native habitats as “enclosures” (wetland, forest, high country, the night, and the coast) each with a range of plant and animal species typical of the area, will supercede the place of many mainland sanctuaries, because they will have species easily accessible to the public (eg kiwi, long-finned eels, various birds, etc etc) as well as providing reservoirs of plants and animals for transfers. Even if you don’t like the idea of zoos, take a look at what is planned. The change away from exhibiting individual species to one where whole habitats form the “enclosures”. Starts to make them look a bit like how a lot of people see some fenced sanctuaries. The reason I’m so hyper- about this particular issue, Steph, is that I’ve chaired the Central Auckland branch of F&B for ten years (and been on the committee for 23) so you can imagine the changes I’ve seen in the zoo over that time. The zoo now is just a totally different beast to what it was 20odd years ago when our branch had it’s meetings there and this really upset some people including the Wellington-based F&B Conservation Director (..8-) ). Conservation is the order of the day now!! And to be honest, as time goes on and wild habitats reduce and the human population increases, the zoo here provides increasingly a real opportunity for us to show native spp to people like nowhere else. In fact, our August KCC trip is a night visit to the zoo. So to answer your question above, yes, native species housed there in habitats as opposed to traditional enclosures of individual species likely will draw in increasing numbers of nature-lovers I reckon. I find it staggering that you have questioned whether people will like native species in zoos. 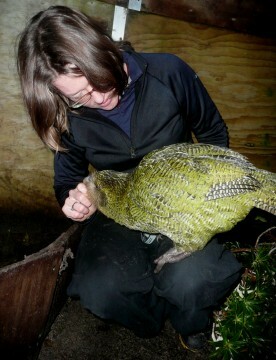 I formally worked at zealandia for five years (2005-2010) showing around 30,000 people almost entirely native species and the feedback we recieved was entirely positive. There was a strong sense of personal ownership and connection to “our” species. Zoos clearly have seen the need to jump on the “conservation bandwagon”. Otherwise they are becoming increasingly irrelevant. Good on them and rightly so. The beauty of zoos doing conservation is the chance to introduce these messages to new audiences. The challenge is how to link the good work each of these organisations are doing and not duplicating precious resources. IT does seem unessessary that wellington zoo is spending so much on a native species exhibit when zealandia is around the corner already doing it, but their conservation medicine centre is first class. Looks a bit like the Tiris and the Karori Sanctuaries out there to me, so I head Tom’s concern about replication, but apart from that, the encosure looks like it’ll attract people to view some of our native birds which they otherwise mightn’t get to see. Just an aside – we’ve now had the KCC trip to the zoo I mentioned earlier , and it was full – 46 odd people(and despite a high cost compared with most of our KCC trips).